WHAT YOU GET:We will serve you 30-DAY MONEY-BACK GUARANTEE for any reason and friendly helpful customer service, if these paint trays do not meet your need. It would be wonderful gift for you beloved children. 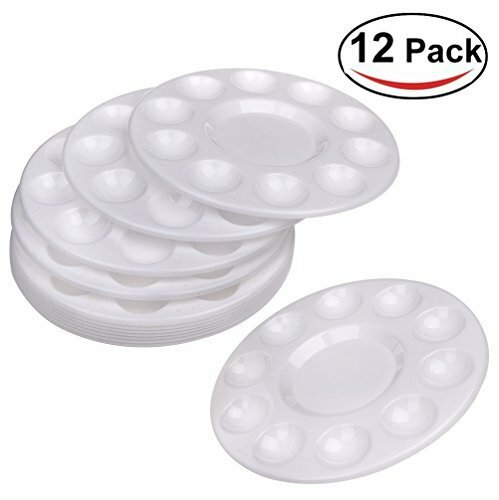 Round plastic paint tray perfect for oil watercolor acrylic paintings DIY craft. The paint tray palette is made of sturdy plastic but light enough to hold in hands, especially for kids. Paint pallet is convenient to take out and wash off quickly. 10 wells and 1 central reservoir is ideal for painters to separate or mix pigments. The plastic palettes can be stacked together, saving spaces of your room, and are easy to carry and ideal for travel. Package Includes: 12 x Round Palettes. If you have any questions about this product by Hulameda, contact us by completing and submitting the form below. If you are looking for a specif part number, please include it with your message.